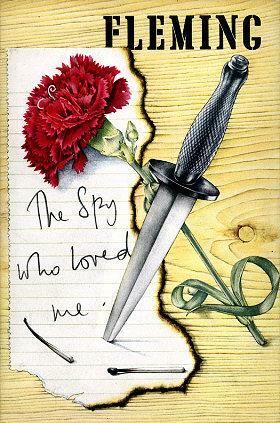 The Spy Who Loved Me was published on 16 April 1962 in the UK as a hardcover edition by publishers Jonathan Cape; it was 221 pages long and cost 15 shillings. In the letter, Fleming goes on to suggest that they might use a “frilly heart shaped Valentines with a dagger thrust through it” as a possible cover. In the end, however, they decided upon a simple dagger and a flower. This time the flower is a carnation rather than a rose, representing the chance encounter between the narrator and the hero. The dagger pierces a partially burnt, hand written note that bears the title of the novel and pins it to the traditional wooden background. It is a testament to Chopping’s skill as a n illustrator that he managed to capture in the book’s excitement, danger and romanticism in such a simple design. 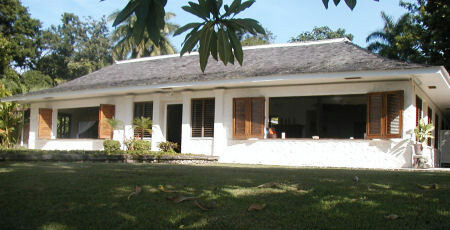 The Spy Who Loved Me was written in Jamaica at Fleming’s Goldeneye estate in January and February 1961 and was the shortest manuscript Fleming had produced for a novel, being only 113 pages long. Fleming found the book the easiest for him to write and apologised to his editor at Jonathan Cape for the ease. The Spy Who Loved Me has been described by Fleming biographer Andrew Lycett’s Fleming’s “most sleazy and violent story ever”, which may have been indicative of his state of mind at the time. Fleming borrowed from his surroundings, as he had done with all his writing up to that point, to include places he had seen. One such location was a motel in the Adirondacks in upstate New York, which Fleming would drive past on the way to Ivar Bryce’s Black Hollow Farm; this became the Dreamy Pines Motel.